Create your own bespoke blends with mix-and-match perfume set. Designed to be layered on your skin to create a personalized perfume experience, this set is made up of eight expertly crafted rollerball fragrances that can be combined to evoke a specific mood or intention. Each of the alcohol-free, blendable perfumes comes from a distinct fragrance family: musk, oriental, marine, floral, vanilla, citrus, and fruity. Consult the seven prompt cards for examples of how to build your own perfume, or experiment with bespoke layers that capture the essence of the current moment. Whether you feel inspired, serene, electric, tender, free, tenacious, assured, sultry—or everything all at once!—these infinitely mixable aromas let you be your own perfumer. Made in Texas by Sammi Hill. 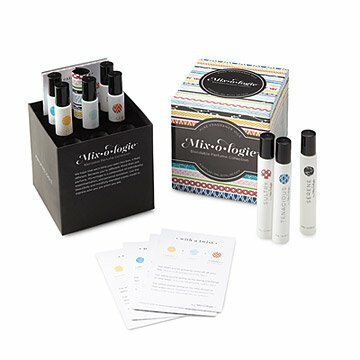 A scent-loving member of our team tried our Mixologie Blendable Perfume Collection and was very favorably impressed with not only the aromas but how long they lasted. Read her review on our blog. Black raspberries burst with citrus from Sicilian lemon and orange zest. Green tea, moss, silver sage, French lavender, and geranium leaf add vitality and a clean crispness. Creamy sandalwood, patchouli, and vetiver create rich, smokey undertones. Fresh and aqueous marine notes keep things light and airy while crushed violet leaves add a feminine touch. Beautiful exotic white musk and blonde amber surround fresh watery accords and a modern rose muguet. A gorgeous floral blend of white freesia, jasmine, rose, ylang, and cyclamen combine with sparkling bergamot, Madagascar vanilla, musk, and sheer woods. Cool, refreshing, and brisk top notes of salty marine air soar over watery peony blossoms, Caspian rose, and cool sea moss. Madagascar vanilla bean harmonizes with smokey musk, amber, woody sandalwood and white oak. Aged bourbon, tobacco flower, and tonka conclude the blend with just the right amount of mystery. Fresh and bright top notes of bergamot, petitgrain, and geranium leaf blend into rosa damascene with highlights of cyclamen, white lilies, and neroli blossoms. A playful citrus medley of pink grapefruit, zesty lemon, and sweet mandarin. Sammi and her partner, Jeff Wise have been in multiple businesses together. This time, it was time to create something that would shake up a product category that didn't seem to be keeping up with the movement of personalization - Perfume. For decades, perfume sales have relied on celebrity endorsements. With the growing demand for personalization in all of our products and services, Sammi and Jeff believed it was time to give women a chance to personalize their fragrance. Why are women buying a fragrance just because a celebrity's name is on the bottle? What woman wouldn't want to craft her own signature blends? It was simply time to make perfume personal. Meet Mixologie! 5" L x 5" W x 7" H; 0.17 FL oz. I would buy this again and may buy one for a gift. I love the whole idea of this. It is fun to mix smells or wear them alone.